Reverso Plus is the best tested seat in it´s group, and the design is unique. The Reboarder that impresses everyone. Reverso Plus comes even with the strong Plus test from VTI in Sweden, and is fully sealed in the belt mechanism, with a new button that you need to press from the front side in stet of pushing from the top. The CONCORD REVERSO Plus impresses thanks to its broad range of applications. Thanks to the separately cushioned newborn inlay, the seat is a fully fledged cradle for ages up to three to five months, and this seat even has an extra soft inlay. Thereafter, without the inlay, it is suitable for children up to a height of 105 cm. In terms of handling, the CONCORD REVERSO is far ahead of other Reboard seats. The convenient rotating wheels allow the leg supports and, in particular, the angle of sitting or lying to be adjusted. This can even be done comfortably from the driver's seat. As a rule, all the adjustments can be made from all sides and are marked with clear, mechanical red-green indicators, as is the Isofix mounting. In general, the CONCORD REVERSO represents a new generation of Reboard seats. Its clear, tidy design is a visualisation of the new technology. A circular lightweight aluminium protection frame with an internal multifunctional shell, made entirely from shock-absorbing material, offers maximum protection with minimal weight. With the inlay for newborns inserted, the CONCORD REVERSO weighs 10.9 kg – without the inlay it even weighs in at under 10 kg (9.9 kg). NEWBORN INLAY the seat is a fully fledged cradle for ages up to three to five months. Extremely easy to handle and suitable for children from birth to a height of 105 cm. REVERSO.PLUS i-Size vers. 3. takes a child from birth (40 cm to 105 cm) or Weight: up to 23 kg / Age: approx. 4 years. CONCORD is one of the most recognized suppliers of child equipment in Germany. Their history began in 1978, where Heinz-Joachim Kaufmann founded the company. Maximum safety, simple handling and increased comfort has the highest priority to CONCORD, when it comes to their products. They only use the top range in quality and extraordinary designs. Usability – It has great importance that their products are customized to the children's needs, is functional and practical. The products are to help the parents in their every day lives. Simplicity – The products are easy to use and understand in the everyday live. Personality – The products are designed to fulfill a function and are valued because of their high quality. 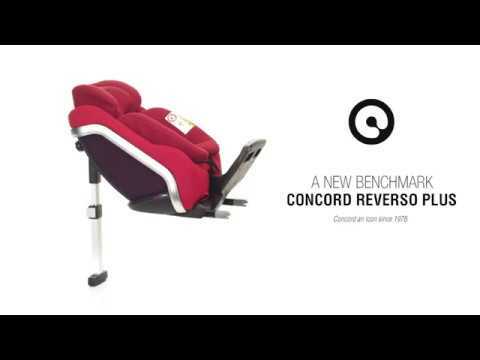 Quality – CONCORD uses only child-safe high quality materials in their production. The creation and processing of the products is reliable, solid and robust. Service – CONCORD attach great value to customer satisfaction. They care for the customers interests and offer a complete and professional service. Since 2010, CONCORD has worked together with Unicef in order to reduce the child mortality in Congo. This they do through the mosquito nets, which ensures that the children can sleep safely without the fear of malaria, which is one of the biggest proportion of the children deaths.